Holidays promise to be unforgettable and enviable affairs when you reside in a vacation home like Villa Saan. 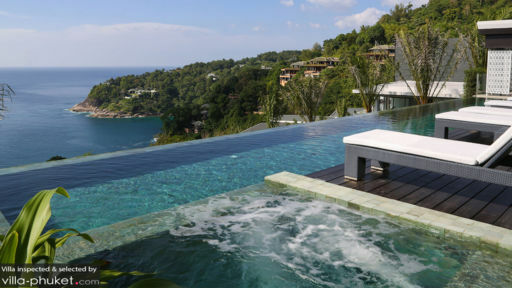 Set in a prime hilltop location in Cape Sol, the villa overlooks Phuket’s rugged coastlines and the Andaman Sea. Villa Saan offers more than just spectacular coastal views - you’ll also have a wide array of amenities, such as a gym, spa room and cinema at your disposal, and enjoy the impeccable service offered by the staff here. 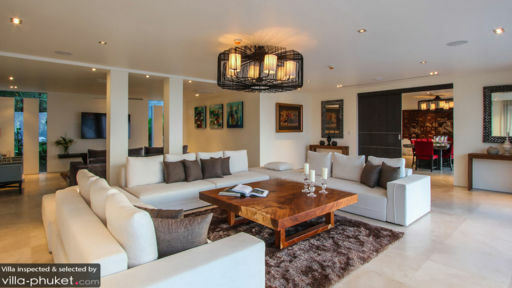 Containing a total of eight bedrooms, Villa Saan is well-suited for large group retreats. Make your move quick if you’ve got your eye on the master bedroom - this well-contended room comes with sea views, as well as a deck that extends out to a bubbling outdoor jacuzzi. Bedrooms 2 and 3 come furnished with silky cream drapes, soft white linens and gorgeous bathrooms with glass walls that draw your gaze out towards the ocean. Push back the sliding doors to step out to a sun-soaked wooden deck - it’s the perfect spot to enjoy your morning coffee as you take in the picturesque views. Bedrooms 4, 5 and 6 offer twin bed configurations. Just like bedrooms 2 and 3, the rooms are furnished with thoughtful touches to facilitate a night of restful sleep, and are outfitted with a private outdoor balcony. Sink into the 20-metre infinity pool; it offers a refreshing dip and views out to the sparkling ocean. If you’re not in the mood for a swim, lay back against one of the pillowy white daybeds lining the pool - there are few spots better than these for indulging in cocktails and basking under the sun. Remain at the pool deck if you enjoy poolside relaxation; otherwise there’s a breezy outdoor deck that comes with plenty of rattan chairs and sea vistas. You’ll be spoilt for choices when it comes to indoor relaxation at Villa Saan. Catch a film in the TV room, round up your fellow travellers for a movie marathon in the cinema or relax in the spacious seafront indoor lounge. The gym at Villa Saan offers views like no other; work up a sweat as you let our gaze rest upon the glistening pool and boundless ocean. Carve out time for some T.L.C. by indulging in a massage treatment in the finely-appointed spa room, which comes fitted with two massage beds and walls coloured in rich purple hues. Villa Saan offers housekeeping services. Airport transfers, car rental, personal driver service, personal chef service, child-minding service and in-villa massages are available at additional cost. 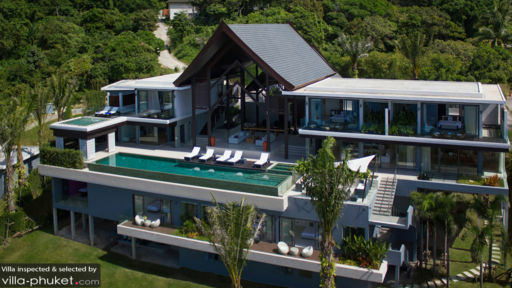 Villa Saan is located in Kamala, a coastal town in West Phuket. While it’s located just north of Patong, Kamala exudes a different vibe altogether; the town offers a family-friendly setting, and draws in a crowd largely made up of expats and family vacationers. The beach, restaurants, spas, yoga studios and attractions are located within close proximity. Kamala Beach is located about 13 minutes’ drive from your villa. Take a 10-minute stroll from the beach to Kamala Night Market, a weekly outdoor market held every Friday to experience the local street food and shopping scene. Work out the knots in your body by joining in drop-in yoga classes at Anantra Yoga Patong or iYOGA. Your villa manager will assist with arranging for in-villa yoga session if you prefer a one-to-one session. Alternatively, unwind with a decadent spa ritual at top-notch spa establishments like Oasis Turquoise Cove Spa Phuket or Spa by Paresa. The latter boasts treatment suites with uninterrupted vistas of the Andaman Sea - what a treat! Guests will enjoy Kamala’s varied and vibrant dining scene. Hang out at the stylish HQ Beach Lounge, sip sundowners at Vanilla Sky Bar and Lounge or polish off succulent steaks at Plm Prime Steakhouse. But do leave an evening or two free to enjoy the incredible in-villa dining experiences at Villa Saan, where you’ll have the option of dining under the stars at one of the villa’s many outdoor decks or terraces.